Upptäck Skottlands dramatiska landskap och ännu mer dramatisk historia på denna helgedagstur från Glasgow. 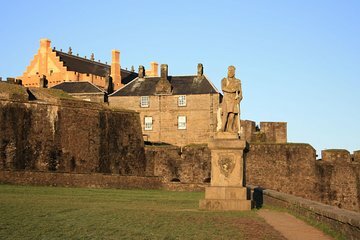 I en liten grupp, vind genom Skotska höglandet till Stirling Castle, tidigare hem av Mary, Queen of Scots. Hör om legendariska strider som ägde rum där och fortsätt vidare till Doune Castle och Trossachs National Park. Promenera runt Loch Lomond och ta en valfri whisky rundtur i Glengoyne Distillery. Lämna dig bakom staden och få en smak av Skottland, som är otjänad! Din 9-timmars resa genom de vilda skotska högländerna börjar i centrala Glasgow. På morgonen samlas med din lilla grupp och tavla en lyxig minivan för det första korta benet på din resa till Stirling. 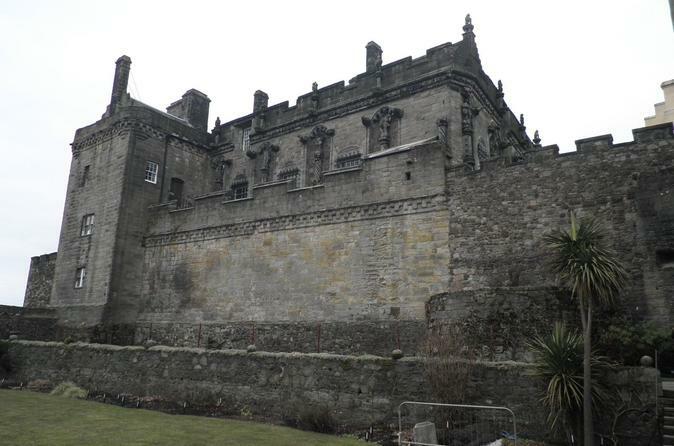 Lämnas på Stirling Castle, ett kritiskt medeltida högborg som har uppe på toppen av sitt steniga toppmötet sedan 1000 f.Kr. Den före detta bostaden för skotska kungligheter inklusive Mary, Queen of Scots, slottet visar fint arkitektur och inredning, som du är välkommen att se med en valfri tur (egen kostnad). Efteråt, huvudet in i det vilda landet, passerar Doune Castle och Callander på väg till Trossachs National Park. När din tränare färdas genom böljande kullar och gröna betesmarker, kommer din expertguide dela fascinerande sanna och fiktiva berättelser om lokala figurer som William Wallace, Rob Roy MacGregor och den rogivande Robin Hood. Gå sedan till Loch Lomond, sista stoppet på din resa. Promenera på stranden av denna lugna sjö och dyka in i det rustika Glengoyne whiskydistilleryet. Köp dig själv en rundtur och nyp på lokal whisky, eller besök bara butiken. Dagsdagsresa slutar med kvällsdränningen vid avresan i Glasgow. Trevlig tur, fick se vackra vyer och en inblick i whiskykulturen. Stoppet vid Stirling Castle borde ha varit kortare och istället ett längre lunchstopp. Det kändes stressigt att hinna äta, hann inte kolla runt i byn tyvärr. This was a very good tour. A little history, a little nature and a little whisky! Not too long of a drive between stops. Fraser was great. Funny. Kind. Knew when to stop talking and when to inform. Had a great day with Nicola seeing Scotland! Everything ran smoothly and there was a good amount of time at each place. Nicola was very approachable and informative. It was a great overview and we learnt heaps about the history of Scotland. Would highly recommend! The trip was fantastic. Our driver, Allen, is outstanding at what he does. He clearly had an itinerary of what to talk about and when during the drive, and it was perfect. He made me laugh. His sense of humor was incredible. He had jokes to tell, sure, but he also had a wit about him that was hilarious. He taught me history and facts of Scotland. I learned about Sir William Wallace; Scottish folklore, music and history; the coat color of a particular cow; and much more. He made me inwardly reflect. A story he told coupled with an extended pause in his speech and views of the gorgeous Scottish countryside gave me ample time think deeply. I travelled alone, but not once did I feel alone. I cannot speak highly enough of my guide, Allen. The locations were great as well. Stirling Castle was great to explore. We stopped at a few places around Loch Lomond to take pictures. We stopped in Aberdoyle, a charming little town with nice shops, eateries and bars. I could have spent half a day just wandering around Aberdoyle. Our last destination was Glengoyne Distillery, and it was a complete joy. The scotch is premier. If you choose this trip, I do not think you will be disappointed. If you get Allen as a guide, I know you won't be disappointed. Have fun and safe travels! This was my third visit in the past five years. Perched on the volcanic rock outcropping overlooking the glen and bridge where William Wallace won the battle of Sterling Bridge, Stirling Castle is the epitome of 16th Century castles. This is no ruin but a dynamically restored Castle with wall paintings and beautifully reproduced tapestries. Costumed docents help to explain rooms and furnishings in the palace and it’s worth taking a tour with one of the Historic Scotland guides for an overview of the castle’s history. Be sure to check out the various galleries, especially the one that displays the ceiling bosses from the time of King James. While the tour of Stirling Castle and the Whisky tasting were fine, the trip to Loch Lomond was a total disappointment. We went to a very touristy town where the only view of Loch Lomond was looking out over a boat basin. Instead of seeing what is supposed to be the most beautiful lake in Scotland, all we saw were dozens of small power boats docked in a basin. I am just not the best person for these kind of trips. I was spoiled by my first day trip with Rabbie- just six of us on a little tour of the Black Island. There weren't a lot of stops and we had eniough time at each. On this one, Stirling Castle and lunch stops were too short; the whiskey stop was too long, with nothing for someone who didn't like whiskey to do. Our guide Gordon, was well informed, entertaining, and very congenial. He gave us interesting side trips. Our driver, Grant, was very knowledgeable in the local area as well as in the history of the area. We saw a lot more than we expected and had a great time. Never felt rushed and really enjoyed the tour including the Glengoyne distillery at the end! Very much enjoyed this tour and our guide Cameron was fantastic. One of the best tours I have ever taken, and Cameron's stories and music made the trip enjoyable for all.